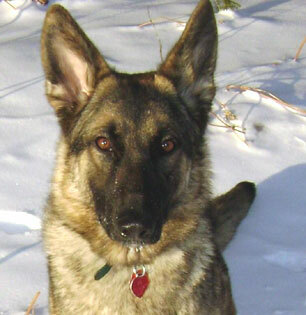 GSD dog health check up's are an important part of the German Shepherd Dogs growth and development. All types of dog training can aid in this process as well since many parts of your dogs body may be touched, etc. For all German Shepherd owners, regular monitoring and "examinations" of your GSD will give you a better idea of the dog's overall health and prove as good "quality" time for both you and your dog. Also, this may help you catch a problem in the early phases and certainly before it becomes life threatening. The list of things you can do during this dog health check up could be very, very long but below we've taken the time to list a few of the most basic and easy to read signs of your German Shepherd being "off". In addition to all the usual, these dog health check up steps may help you in deciding your German Shepherd’s current actual state of health. 1) Build up in the tooth area. Also bad breath- which may suggest gingivitis or other tooth/gum problems. 2) Clean ears? Do you see wax build up, ticks, mites or other parasites inside? Is a bad odor present? Does your dog shake its head often? 3) Are the eyes discolored or irritated? Is extensive matter present? 4) A ”greasy” coat? Is the dogs skin grey white or red and irritated? Do you find evidence of fleas or other parasites? Is the smell of the animals coat on your hands, after checking it with your fingers, fishy, rank or offensive? A doggy odor, while common, is still a sign of a low level of health. If your answers to many of the above check up areas are “YES”, then you should plan some type of action to discontinue this cycle of bad health for your dog. First and foremost, diet is the best place to start. Consult with your veterinarian and/or check into possible alternative therapies. In the end, your pet’s overall health is up to you, so these early warning signs should not be overlooked. A clean bill of health is the most valuable gift you can present to your dog - next to your love and attention. If you live in an area that is prone to ticks then regular checks need to include a search for ticks that have attached themselves to your GSD. If you find one check our tick removal guide.